"This is sharp, vivid, and gut-wrenching story-telling of the most powerful kind." -Catherine Mayo, author, The Last Prince of the Mexican Empire Ellen Prentiss Campbell's debut novel, The Bowl with Gold Seams, is a moving, intimate story of unexpected personal transformations. An unusual chapter in the long history of the Bedford Springs Hotel in Pennsylvania inspired this work of historical fiction: during the summer of 1945, the resort served as the unlikely detainment center for the Japanese ambassador to Berlin, his staff, and their families. 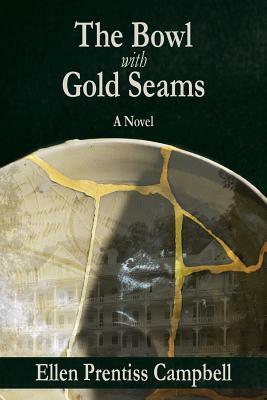 The Bowl with Gold Seams tells Hazel Shaw's story as a young woman working at the hotel among the Japanese, and the further story of the reverberating lifelong consequences of that experience. The final events of the war challenge her beliefs about enemies and friends, victory and defeat, love and loyalty. In the ensuing years she remains haunted by memories. An unexpected encounter causes Hazel to return to the hotel long after the end of the war; she must confront her past, come to terms with her present life, and determine her future.